Colossal Reels is an innovative feature added to a series of slot machines released by Williams Interactive (WMS) which provide players with 100 ways to win across two sets of the reels. The feature was initially implemented in land-based Vegas slot machines, but now you can play Colossal Reels slots online on most WMS casino sites too. Some of the titles from the series are Spartacus, Rainbow Riches, Zeus 1000, Giant’s Gold, Forbidden Dragons, KISS, Lil’ Red Riches, Van Helsing, and more. As you can see from the introduction, Colossal Reels slots use a variety of themes including history, music, fairy tales and fantasy. 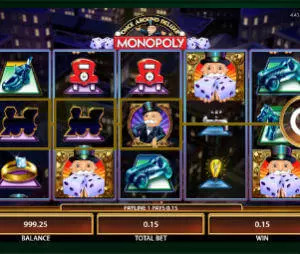 As soon as you launch any of the games from the series, you will notice that they differ from all other slot machines you have ever played as they feature two sets of the reels. The main grid features 5×4 reels while the grid on the right side of the screen features 5×12 reels. The slots allow you to form winning combinations in 100 ways and thanks to symbols coming in stacks you can hit multiple wins at once. If you opt for 100 paying lines, the bet is configured to 50 lines, but you are allowed to decrease the number of active lines as well. 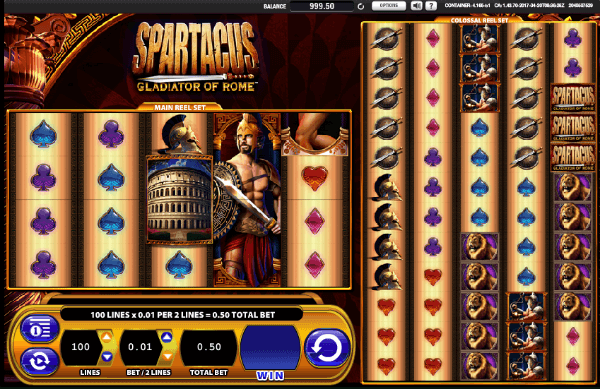 The coin denomination ranges between $0.01 and $5, so you can wager from $0.50 up to $250 per spin at all the lines activated. Autoplay option is also available, allowing you to enjoy spinning the reels without pushing the Spin button all the time. One of the main bonus features available in Colossal Reels slots is transferring Wild which acts as a regular joker with a twist. If a stack of Wilds appear on the main reels, transferring Wilds will clone to the same reel on the grid on the right side of the screen thus boosting your chances of completing multiple winning combinations on both sets of the reels. 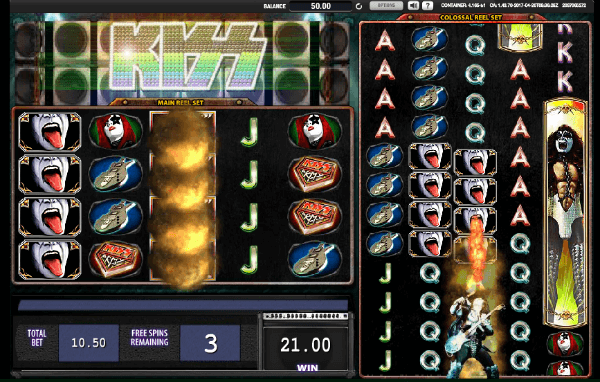 Scatters or the Feature symbols appear on the reels 1, 3 and 5 on both sets of the reels and you need only 3 special symbols across both reels sets to trigger the free spins feature. Depending on the number of triggering Scatters you can win from 8 up to 20 free spins along with 2x up to 20x your total bet. Colossal Reels add more excitement to the gameplay and increase your winning chances. Thanks to transferring Wilds you can simultaneously hit multiple winning combos which can increase your balance substantially. Although payouts might not impress you at first, rewarding bonus features make the games from the series worth playing.